To get the most value for your shipping dollar, you want to ship your cutters in as few boxes as possible. The US Postal service has a new shipping option called the "flat rate box," which allows you to ship 70 pounds (approximately 36 Rayco Super Teeth) in a box they provide to you for free. It can be shipped anywhere in the US for only $12.50. That is as cheap as it gets. UPS also allows you to send 70 pounds in one box, but the cost will be much higher. Heavy boxes of stump cutting products need to be prepared appropriately. Please see below for packaging instructions. To get the most value for your shipping dollar, you want to ship your cutters in as few boxes as possible. The US postal service has a new shipping option called the "flat rate box." It allows you to ship up to 70 pounds (approximately 120 Vermeer Pro Teeth) in a box they provide to you for free. This box can be shipped anywhere in the US for only $12.50. It does not get any cheaper. UPS also allows you to send 70 pounds in one box, but the cost will be much higher. Heavy boxes need to be prepared appropriately. Please see below for packaging instructions. Reach out to us in Jacksonville, Florida, if you need assistance. 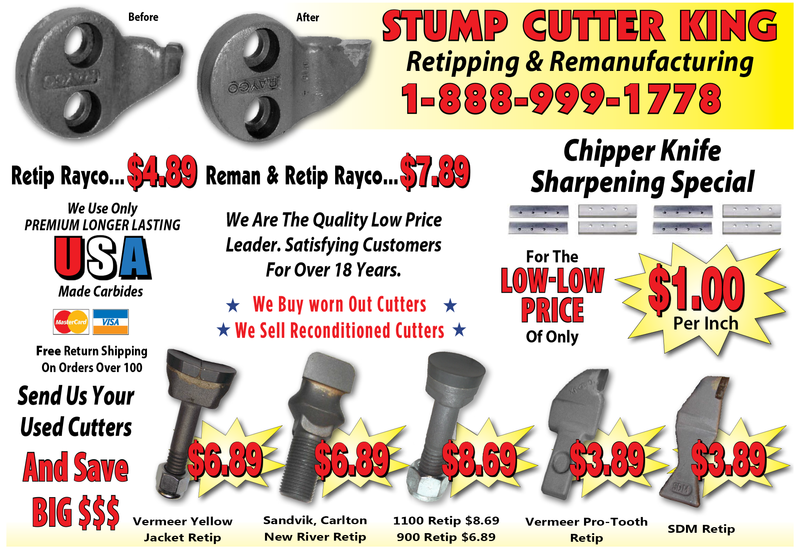 To ensure that we receive all of the stump-cutting tools that you send, here are a few tips to follow. #1) The "flat rate box" provided to you for free by the post office is not a heavy-duty box and needs to be properly taped so it will not break open. Use a 2" wide shipping tape (available at the post office) needs to be wrapped around the box several times in "3" directions. Putting a similar sized box inside the "flat rate box" also helps. #2) UPS requires your cutters to be in a corrugated box, they charge extra for anything else. Be sure to use a heavy duty box or one box inside of another. The box size should be just big enough to hold the cutters. Fill any empty space in the box with crumpled newspaper. You can also use newspaper to line the bottom and sides of the box for extra strength. Tape the box well.